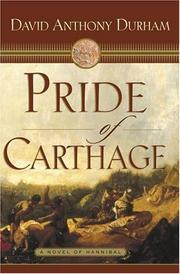 The Second Punic War of the third century b.c., which pitted the republic of Rome against the African empire of Carthage, is the rich subject of Durham’s latest. As in its predecessors, Gabriel’s Story (2000) and Walk Through Darkness (2002), racial contrast and conflict bulk large—particularly in the heart and mind of Carthaginian general Hannibal Barca, who follows the example of his late father, Hamilcar, by waging ongoing war against a foe that has swallowed up innumerable lesser nations and tribes (“It is Rome’s actions I hate. It is the way Rome seeks to make slaves of all the world”). Durham’s sweeping narrative re-creates several years’ worth of crucial exploits, including Hannibal’s legendary passage through the Alps employing elephants as transport, major victories on a blood-soaked riverbank and at the pivotal battle of Cannae, strategic advances toward Rome through the territories of friendly (or conquered) peoples, and the climactic Roman triumph at Zama, conceived and led by young Roman general Publius Scipio, and followed by Hannibal’s return, emaciated and defeated, to an enfeebled Carthage. Durham has reimagined this vanished world in stunningly precise detail, and his lucid explanations of the give-and-take of military decision-making help the reader through some dauntingly complicated material. Nor is this novel merely a pageant: the author vividly portrays both Hannibal’s driven resolve and Scipio’s ruthless efficiency, as well as the conflicted emotions that rule several powerfully realized secondary figures. Among them are: Hannibal’s brothers and comrades-in-arms Hanno, Hasdrubal, and Mago; his gentle, stoical wife Imilce and stern, demanding older sister Sapanibal; Massyli (i.e., Numidian) prince Masinissa, impelled by his hopeless love for an unattainable woman to a perilous conflict of loyalties; and boyish Carthaginian soldier Imco Vaca, who finds his manhood on the battlefield, while losing the woman who (perhaps hopelessly) awaits his return, as the long story ends. One of the best of the current crop of historical novels, and a career-making march forward for Durham.